This hike is an excellent location while staying in the Phoenix area. The greatest thing about this hike was that we did not see a single person once on the trail. The parking area has room for about 15 cars, but ours was the only one in the lot on a Saturday morning in March. Hike: From the parking area follow a dirt path past a ramada with a water fountain. This is the only water available on this hike. This dirt path leads to a paved road which is where I began the distance measure for this hike. 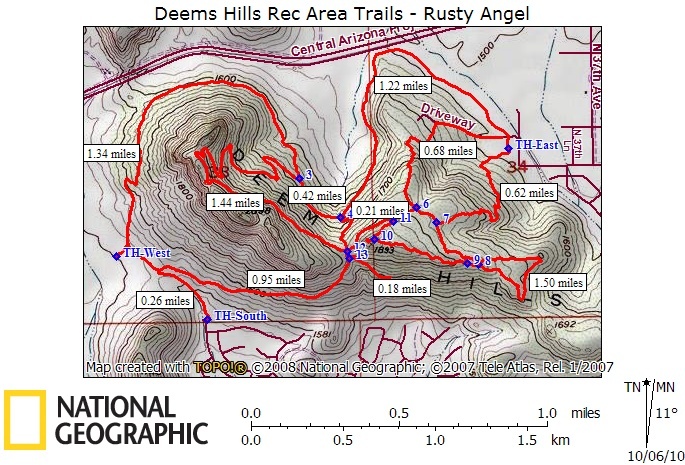 The dirt trail continues, but the Rusty Angel trail is up the paved road. The paved road begins a rapid ascent. This is somewhat strenuous and not very interesting, because it is just like walking along a road, however, motorized vehicles are prohibited. After 0.3 miles of upward climbing, you will reach the trail head on the left. There use to be a metal sign indicating the Rusty Angel Trail. Now, there is a trail post indicating the beginning of the Palisade Trail. From this point onward the trail is a fairly wide dirt path that is easy to follow with trail markings throughout. The trail continues to climb the hill with a steady incline, passing a partially buried structure at 0.43 miles. A water tank, I think. At around 0.75 miles the Palisade intersects and joins the Basalt Trail. These trails continue on as one for 0.1 miles where they separate. The Basalt going west (right) and the Palisade going more southwardly (left). This may sound confusing, but the trail post actually do a good job of keeping you on the trail you want to be on. Continuing on the Palisade will get you to the high point of the hike in another 0.1 miles. (This would be about 0.94 miles into the hike). The trail doesn't actually reach the high point, but there is an obvious lookout trail that splits off to the west that will bring you to that point. This will only add a hundred yards to you hike (at most), so it is worth doing, if its your first time. The views were pretty amazing for a total travel of only 0.5 miles and you'll get an idea of some of the other trails in the park. There is not really anywhere else to go from this vista point, so from here you can turn around and return the way you came. Returning to the Palisade Trail you'll want to continue where you left off. The trail will start a gradual decline and head off in an eastward direction. This makes for a beautiful hike. At this point you will be hiking along a ridge with views to your left and right. In my opinion this was the best part of the hike. You have 360 degree views of the surrounding area. During this stretch you'll come across a couple of connector trails that connect to the Circumference Trail. These connector trails are fairly close together, making the second one seem kind of redundant, but they can be used to add variety to your hikes. However, the Palisade Trail will continue east, bypassing these connectors until ends at its intersecting with the Circumference Trail. At this point, you have hiked the Palisade Trail for a total of 1.56 miles (give or take the mileage of the lookout point). To return to the TH you have three options. You can always turn around and retrace your steps. You can make a right (south) onto the Circumference. 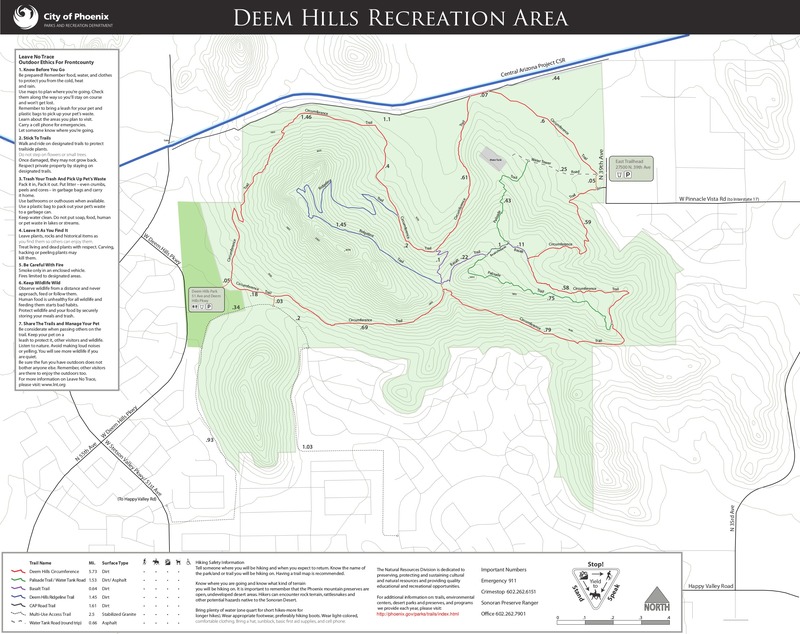 This will add miles to your hike and provide several other options as you go. The most direct route in returning to the TH is by making a left (north) onto the Circumference Trail and following the Circumference back to the TH. In route you'll pass the connector trails that were mentioned earlier and at 2.18 miles you'll come to a juncture where the Basalt Trail starts. But just stay on the Circumference and you'll be back to your car in no time. 2014 Update: Formerly known as Rusty Angel Trail. Originally posted by midnightwaps on 2009-03-29. Revised on 2014-06-07 by mt98dew. From the south: Take I-17 North to the Dixiletta exit. Turn left (west). Cross the bridge and turn left again but don't get back on I-17 going south, instead stay on the frontage road. Travel on the frontage road until you reach Pinnacle Vista. Turn right on Pinnacle Vista. Stay on it until it curves to the right. Just after the curve the parking area is on the left. 2010-03-14 elkhunter4life8888: Alternate Directions: Take I-17 North to Happy Valley Rd exit. Turn left (West). Turn right(North) on 35th Ave. 35th will turn into Pocono Rd (33rd Ave), continue North until you reach Pinnacle Vista. Continue until the road curves and the parking lot will be on the left side.